Team Xbox was proud to once again host the annual Blacks in Gaming Green Room during Game Developers Conference 2018. 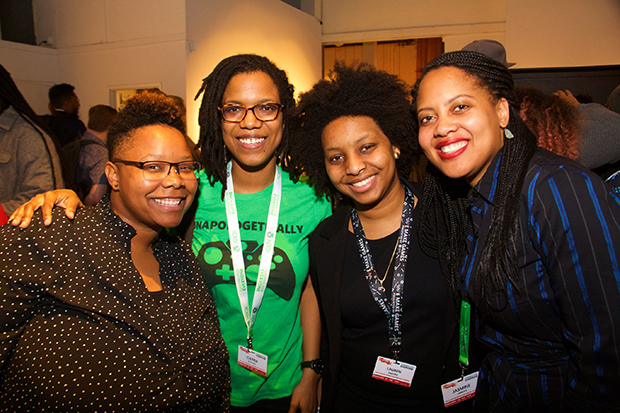 More than 200 game developers and industry professionals attended for an evening of strengthening connections within the community of black game creators and highlighting & celebrating their successes. Watch a short video about our late community Member Gerald A. Lawson. and find great shots from our event photobooth. Held at the beautiful Minna Gallery, the event included fireside chats hosted by Kahlief Adams of the Spawn on Me podcast. Featured speakers included game streamer Simply Undrea ; Jay Bobo and Latesha Williams, creators of the hit game Black Card Revoked; Dr. Kishonna L. Gray, Assistant Professor at University of Illinois - Chicago; and Charles Webb, Senior Writer on Mafia III. All of the fireside chats were video recorded and are available online at the links above. Continuing the theme of celebrating the accomplishments of black game developers, we at Team Xbox were also excited to introduce our Jerry Lawson Grant for Career Development in honor of Gerald A. “Jerry” Lawson (1940-2011), one of the first African American engineers in the video game industry and inventor of the Channel-F gaming console, the first gaming system to utilize swappable ROM cartridges. The grant provided five indie game developers who identify as black and/or of African descent with GDC Conference + Summits passes and an opportunity to meet with Kareem Choudhry, CVP of Microsoft Gaming Cloud. Thank to everyone who joined us at this year’s Green Room event. We look forward to hosting this amazing developer community again in 2019.